There’s a renewed battle in the Wisconsin Senate over the state’s so-called "sanctuary cities." A proposed bill would penalize "sanctuary cities" by imposing fines of up to $5,000 per day. The measure has not yet been voted on. A similar bill passed the Assembly last year 62-35, but didn’t make it to the Senate floor. Busloads of protesters turned out at a public hearing Thursday in opposition of the new bill. As debate over the issue continues, here are three things to know about sanctuary city legislation. There’s no legal definition of the phrase "sanctuary city." Generally speaking, when people talk about "sanctuary cities," they’re referring to any jurisdiction — whether city, county or state — that is taking some action to limit their cooperation with the federal government, says Paul Nolette, an associate professor of political science at Marquette University. 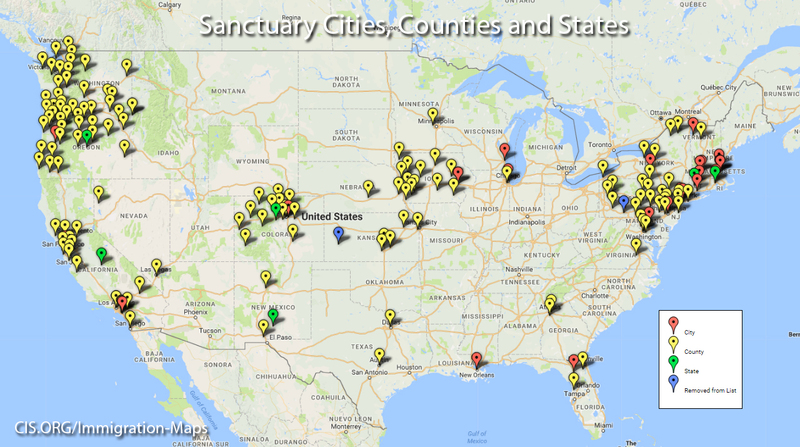 There are sanctuary jurisdictions across the country. The Center For Immigration Studies considers Milwaukee County a sanctuary jurisdiction, based on a 2012 county resolution that directs Milwaukee sheriff deputies to decline Immigration and Customs Enforcement detention requests unless they involve people with felony criminal records, an outstanding warrant, is a known gang member or on the United States terrorist watch list. ICE maintains these requests are an important part of immigration enforcement. Cities argue the requests are not mandatory. Both defense and criticism of sanctuary cities revolve around safety. Proponents of the state Senate bill call it "common sense" legislation, saying it would make cities and communities safer by helping solve and prevent crimes that may be committed by immigrants living in the country illegally. "Jurisdictions that adopt so-called 'sanctuary policies' also adopt the view that the protection of criminal aliens is more important than the protection of law-abiding citizens and of the rule of law," Attorney General Jeff Sessions said in a press release this week. But opponents of the bill say sanctuary cities are safer than non-sanctuary cities. "One thing that (the proposed bill) might do is make it more complicated for police to work with members of (immigrant communities) in, say, solving crimes or getting tips about crimes," Nolette said. "Because people are going to be too scared to come forward to talk to police if they know that police have these wide-ranging powers that are connected to the federal government that might eventually lead to deportation." Research from a political scientist at the University of California-San Diego appeared to support that argument. However, opponents of sanctuary cities point to isolated violent crimes committed by immigrants living in the country illegally. The 10th Amendment makes state jurisdiction over sanctuary cities more likely than federal jurisdiction. This week, the Justice Department specifically targeted Chicago, New Orleans, New York and Philadelphia, threatening to pull funding. President Donald Trump issued a more general executive order in January aiming to keep federal funds from sanctuary cities, but that order was blocked by a federal judge. The 10th Amendment to the U.S. Constitution, which reads, "The powers not delegated to the United States by the Constitution, nor prohibited by it to the states, are reserved to the states respectively, or to the people," greatly limits federal power over city policing policy, Nolette said. "It is important to remember that states do have a lot more control over dictating what local jurisdictions can do, like cities, than the federal government does over cities and states," Nolette said. "In other words, the Wisconsin legislature … they do have more power to do that than the federal government does."